I am going to start writing on Computer topics, starting with, what most you (the non-engineering ones), consider as a difficult topic – DBMS. Only because it sounds so serious and technical doesn't actually mean it’s a tough topic to understand. Trust me, when I first read the chapter, every thing sounded Greek and Latin* to me, so, I re-read it couple of more times and I forgot what had been so difficult! So, what is DBMS? It is Data Base Management System. Off course! I’m sure all you know the full form, but have you really ever given a thought to the words that make up the full form – ‘cause that is where the entire secret lies in understanding the core of this chapter! Data – is any input which has been processed. It can be in numeric, alphabetic or alphanumeric form. Try to imagine data as physical files…the kind of dusty files found in government offices. This processed data (or dusty files) needs to be stored and kept somewhere, so that when we need them we can easily retrieve it. But where do we keep it? How do we keep it? Don’t worry; the computer experts have solved your problem by creating the ‘database’. Database – is simply a ‘place’ where all the data are collected and stored in an organized manner. Think of it as a collection of many steel racks, like the ones found in old government offices! All the files/data are kept according to their serial numbers/file/folder names (or any other identification style), and stored in the racks/database. Management system – In government officers, there are peons who are responsible for keeping the files in the right place, bringing required files to the senior officers, putting it back again after updating the files etc., this is nothing but the system of file management in the office. Similarly, in computer’s database, it’s ‘management system’ is doing the work of the peon; bring the required files, putting back in the right place, etc. but more efficiently than a peon and faster too!! I really do hope some vapour-ish ideas are forming in your head about DBMS! (ii) it also helps in organizing, sorting and retrieval of the records/information from the database, when required by the user, to help the user in decision making (management system). Data integrity(credibility of the data) and security. In govt. offices, anyone can pick up any file! But DBMS requires password authorization to access important files. Backups and recovery are possible only in digital world, hence today physical files are becoming extinct. In DBMS data are stored in relational model, using tables with rows and columns (remember the steel racks!). There are two types of Data Manipulation Languages (DML), Structured Query Language (SQL) and Data Definition Language (DDL). DML are computer languages also known as query language, it is used for accessing and working on the data. In other words, DML (SQL and DDL), are like the languages people use, Hindi or English, in an office to give orders to the peon! Data redundancy – which means there are no duplications of data. No multiple files of the same kind. Data dictionary – is like a normal dictionary, but containing metadata. Metadata – contains information about all the data in the DBMS. The Keys – Primary key is used to identify a particular or specific record (file). It is unique to a particular file. Foreign Key makes a connection between a component (field) in one table with a component identified by a primary key. 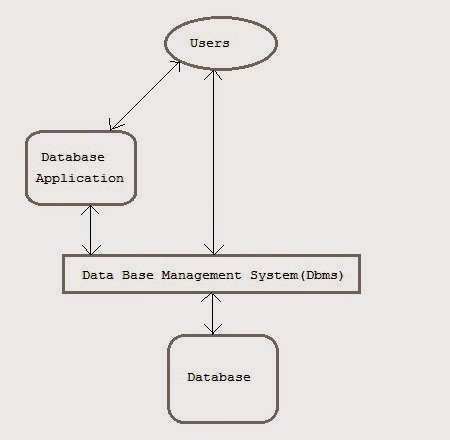 Relational database – is the kind of database model, where there are logical connections between the various files, which are kept in tables. For example: In the given diagram, the information is stored in tables (with rows and columns), in this particular case in two relational tables. Every column has a Field name (employee ID, first name, last name, e-mail ID, Department ID and Department name). 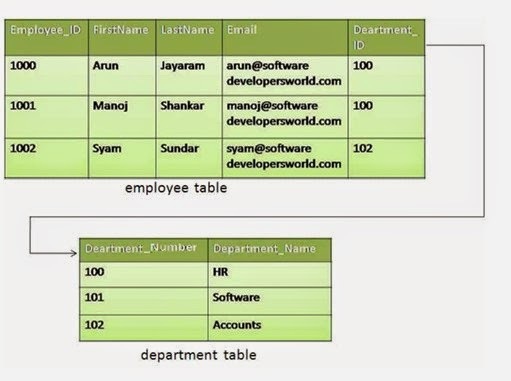 The relation between the two tables is created by the field ‘Department ID’, which connects the Employees name/ID/e-mail to a particular Department like HR or software or accounts. This is relational database, where a relation is made between items of the database. I am hoping that DBMS is no more vapour-ish but solid concrete! It can not get simpler than this! Keep learning and keep sharing the knowledge - that’s the best way to gain knowledge! Thank U So MUCH..VERY EASY TO UNDERSTAND!!! can you plz give idea about trignometry topic which is require for SSC CGL. I will add "Download as PDF" button soon. can you send me computer awareness questions for government exam latest ?